The Gemini Mauna Kea Laser Guide Star (LGS) System is designed to extend the use of ALTAIR for targets for which a bright natural guide star (NGS) is unavailable for adaptive optics correction. In general, LGS AO delivers somewhat lower Strehls than NGS AO, but it allows the use of fainter natural guide stars (because the guide star is used only for tip/tilt correction) and thus is possible over a much larger fraction of the sky than NGS AO. LGS AO produces better performance far from the guide star than does NGS AO (unless the NGS is bright and is located at or very close to the field center). The Laser projects a ~10 Watt beam of coherent radiation at 589 nm into the sky. This beam excites sodium atoms at ~90 km altitude produced from the disintegration of meteors in the Earth's mesosphere.These atoms re-emit at the 589 nm wavelength producing an artificial beacon (a Laser Guide Star, LGS) on which ALTAIR can guide for high-order correction. A natural guide star is still needed for the low-order tip/tilt and focus correction, but this star need not be very bright nor very close when compared to correcting all orders. Stars down to R < 15 within 15 arcsec for high-Strehl LGS correction and R < 18.5 up to 25 arcseconds away from the science target for low-Strehl LGS correction may be used. The laser always points at the center of the field of view, but is invisible to the science detector as the ALTAIR dichroic splits the correction (optical) and science (IR) beams. Laser propagation can only be done under photometric conditions and the guide loops are only stable for decent seeing. Thus, only CC=50% and IQ=70% or better observations are offered for LGS. Due to the need for technical support, the LGS is only available for certain defined periods scheduled well in advance. During LGS runs, both non-LGS queue and LGS queue programs will be executed. In general, PIs of LGS programs should request SB=Any conditions so that full moon observations can be conducted. The following table summarizes the Sky Background (SB) requirements for different natural guide-star magnitudes. Note that for point sources fainter than 17.5, you may wish to consider the 'open-loop' focus model technique. In 2009A, we upgraded the SFO so that its limiting magnitude more closely matches the STRAP (tip/tilt) sensor's limiting magnitude, so use of this technique for point sources should be rare in subsequent semesters. LGS mode is available 7-14 nights per month, in queue mode only. Target lists are generated for approval by the Laser Clearing House (LCH) at Vandenberg Air Force Base approximately one week before each LGS run, using only "ready" observations. Therefore, while observations must be defined by the usual phase II deadline, any additions or alterations must be in place by the LGS target list preparation dates. These dates are listed in the "Special Instructions for Completing Phase II" link which can be found on the "Observing with Gemini" page. Limited LGS observations of Band 1 and 2 Targets of Opportunity triggered less than a week before, or during, an LGS run, are supported. Only two such targets can be observed during any LGS run, and only one on any given night. All efforts will be made to approve and observe a target within 24 hours, however a delay of two or three nights is possible. For a detailed list of when LGS runs are scheduled, PIs should consult the current semester schedule for Gemini North (GN). The use of ALTAIR+LGS is currently limited to targets with elevation of 40 degrees or greater (the previous 49 degree limit has been improved due to a change in the optical bench). The current 40 degree limit is a hard limit due to the optomechanical design of the instrument. Further improvements will be very difficult to make and would only take place on timescales of months or greater. These improvements are being considered. The largest science impact of the 40 degree elevation limit is that targets south of Dec=-30 and north of Dec=+70 cannot be observed. Note that the Galactic Centre is above the elevation limit for about 1.5 hours every day. Targets near the RA boundary may be observable if they are short duration observations. Targets beyond the Dec boundary cannot be observed under any circumstances due to the elevation limit. High Strehl Correction in H, K, and L (1.6 to 2.5 microns) requires a bright (8.5 < R < 15) tip/tilt star with 15 arcseconds of the science target. Delivered Strehls are currently about 50% of that seen for NGS: 10% in H and up to 20% in K. L-band LGS has not been tested. The background in L is considerably higher with ALTAIR in the beam than with NIRI alone. However, angular resolution will be close to the diffraction limit. Observations shortward of H (such as z and J) will not produce high Strehl ratios even for bright tip/tilt stars. Low Strehl Correction will occur with with a faint (15 < R < 18.5) tip/tilt star within 25 arcseconds of the science target or with a brighter tip/tilt star further than 15 arcseconds from the target. Delivered Strehls should be a few percent in J, up to 10% in H and K. The 25 arcsecond limit is a hard limit based on the ALTAIR optics, i.e. guide stars further than this cannot be observed with LGS. Note: for guide stars between 18 < R < 18.5, a dark time request is required and stars between 17.5 < R < 18 require grey time. All observations shortward of H (1.6 microns) should be considered Low Strehl. Both high-Strehl and low-Strehl correction are possible for any combination of non-sidereal and sidereal science targets and tip/tilt stars. Guiding on extended objects: Note that galaxies with stellar-like cores may also be used for guiding. At present, only sparse data are available on which cores should work and which will fail. We currently expect guiding to work if the full width at half-maximum of the core is smaller than about 1 arcsecomd. (This corresponds to about a 1.5 magnitude drop in surface brightness per arcsec of distance from the core.) More galaxy cores near this performance limit need to be tested to refine this number. Note that for extended sources, you may wish to consider the 'open-loop' focus model technique. In addition, extended objects are more difficult to guide on since only the core is used for guiding, not the entire flux of the source. Therefore it is suggested that limits approximately 1 magnitude brighter than those for point sources be used when trying to determine target feasibility. Note that if your Guide Star is brighter than R < 10, you should consider using NGS. There is a risk of damage to the LGS tip/tilt wavefront sensor from such bright sources, however placement of the optional neutral density (ND) filter into the beam now allows the use of LGS on bright targets (such as calibration stars). Performance is in general a strong function of guide star brightness. As the LGS system performance encompasses a factor 1000 range in flux, it is important that the guide star brightness be estimated accurately. We have found that the best catalog for guide star brightness is the UCAC2 catalog U magnitude, which roughly approximates the R-band observations of the tip/tilt star. The UCAC2 catalog limit is about 16th magnitude. Below this limit the USNO-B1.0 catalog is the most accurate. Note however, that the catalog has uncertainties of order 0.5 to 0.75 magnitudes so backup targets should be provided for the faintest stars. As described above, stars brighter than R=10 must be observed using the ND filter for LGS. Most telluric standards and many photometric standards should simply be observed in NGS mode which does not require the ND filter. Below is an analysis of a R=13.3 magnitude star compared to diffraction limited observations (Kprime, 0.5 arc V-band uncorrected seeing, elevation 76 deg, 5 sec x 2 coadds). In the radial plots (top panels), the LGS PSF is denoted by x's and the diffraction limit is shown as a solid line. 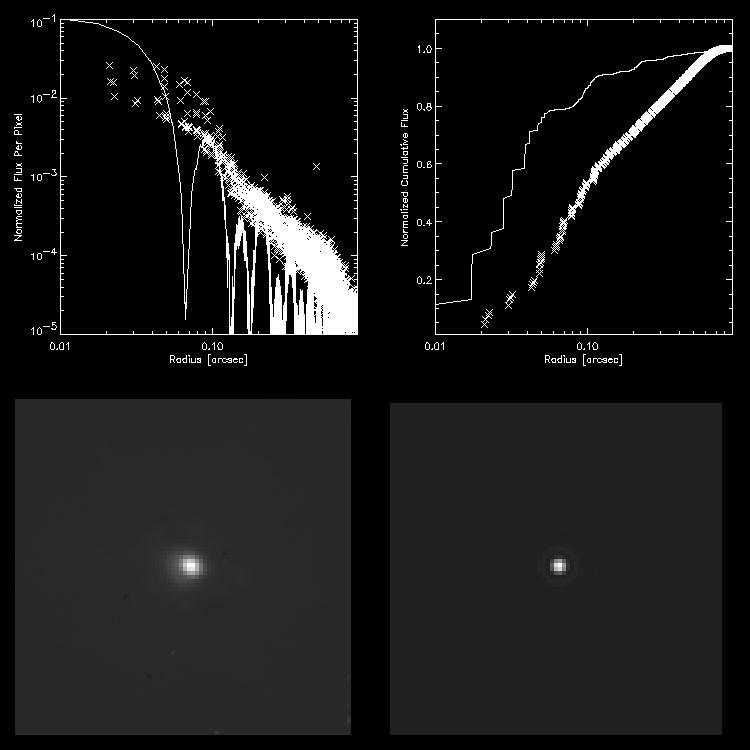 An image of the LGS PSF is shown in the bottom left panel compared to the diffraction limit in the bottom right panel (images span 1.8 arcseconds). As we track a target using LGS, the distance from the telescope to the sodium layer changes, as does the thickness of the sodium column along our line of sight. The altitude and thickness of the sodium layer can also change during the course of an observation. These effects change the distance to the laser guide star, which then appears de-focussed to ALTAIR. ALTAIR then tries to keep the LGS in focus, with the result that the science target becomes de-focused (the laser guide star is only at about 90km, remember, not at infinity) as ALTAIR corrects the laser guide star. To avoid this, the tip/tilt reference star is used to actively measure the focus during the observation, providing a correction to ALTAIR for the non-infinite distance to the laser guide star, and the relative changes in distance to it. Sometimes when guiding on some faint and/or extended sources, such as a galaxy nucleus, there is insufficient signal for the focus to be measured. In these cases, we do not actively measure and correct the focus during the observation, but instead use an 'open loop' model that corrects only for the changing distance to the laser guide star as the telescope tracks, assuming a sodium layer of uniform thickness and height. We firstly 'tune' the LGS focus on a nearby bright star (typically within 6 arcminutes of the science target, due to clearance windows), and then slew immediately to the science target and begin observing. From the experience we have had of using this technique, it seems that the atmosphere above Mauna Kea is stable enough such that the open loop model is a very good approximation on timescales of an hour or so, and there is little degradation of image quality caused by this focus model on these timescales. Therefore, if you are using a galaxy nucleus or a guide star close to the limiting magnitude, it may be necessary to use this method for your observations. This will involve an additional 10 minutes of overhead per hour or so of observation, since the focus should be 're-runed' roughly once per hour. You may also wish to include some observation of the focus star after your science observation, before and after re-tuning, in order to have an idea how significantly the focus changed during your science integration.